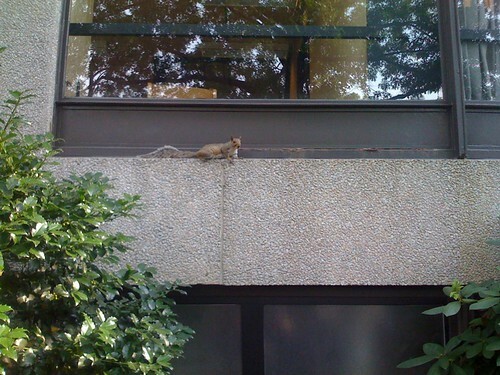 While biking behind one of the Boston University buildings Friday afternoon, this spider squirrel caught my attention. I love how 80-90% of its body, including its head, is below the ledge as it scampers about! BTW, the squirrel did make it safely around the pillar and back, fully, onto the ledge. 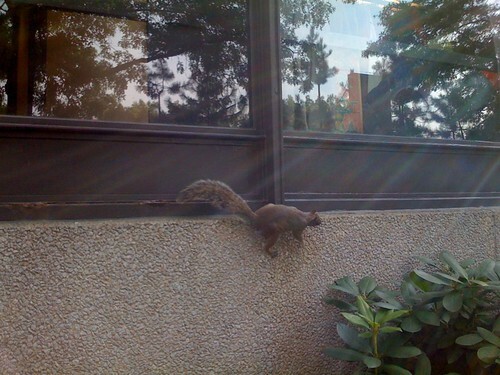 Spider squirrel, spider squirrel, does whatever a spider squirrel does! I was just surfing along and stumbled onto your post. I really like how you got the photo at such a definitive moment in the squirrel’s travels. I think it’s amazing how squirrels seem to be able to climb just about anything with ease, no matter how dangerous it actually is. I just took a browse throughout you site and think it is very informative and I like your design choice. And again, cool photos of the squirrel. Thanks for browsing over and the nice compliments Darren! Honestly, I got a bit lucky with that second photo, that squirrel was shimmying quite quickly along that ledge. Just checked out your post, nice photos and very catchy remix! All these photos are really surprising and m much surprised by reading that how squirrel lift him backward and how it travel along the wall by lifting itself.